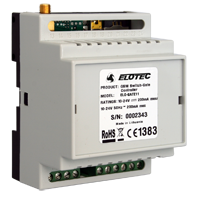 The ELO-GATE GSM gate controller enables you to open a gate simply by making a call. If the incoming phone number has been registered in the system, the automated will trigger and open the gate. No keys or codes are needed! Unauthorized numbers are rejected by a busy signal. Access can be limited to defined opening hours using the integrated calendar. The device has three inputs for sensors, with a possibility of setting delays. If the gate doesn't close after a given time, e.g. 20 seconds, a warning is sent by SMS. Up to five administrators can be notified.